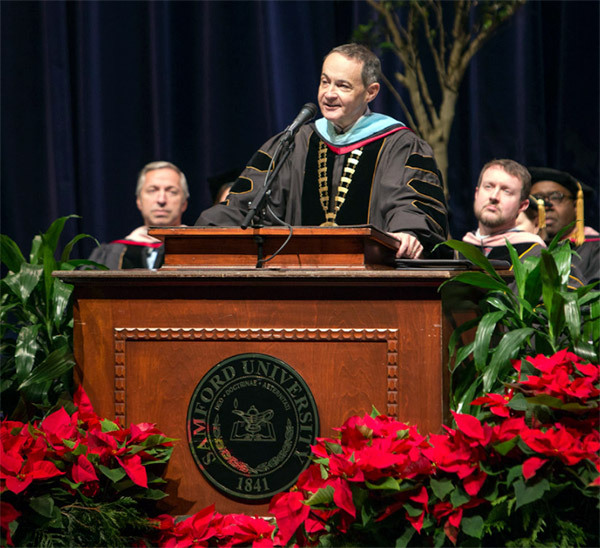 Following is a transcript of Samford University President Andrew Westmoreland’s remarks to graduates during fall commencement ceremonies Dec. 16. A few months ago, Jay Flynn, our University Registrar and Karen Rayburn, Commencement Planner and Assistant to the Registrar, sat in my office to break the news to me that, because of the anticipated number of fall graduates, we would need to have two commencement ceremonies on the morning of December 16, and that we would need to manage the arrival and departure of all guests for both ceremonies so that the Wright Center could be cleared and cleaned by 1:15 pm to make way for a performance of the Nutcracker, for which the Wright Center was contractually committed. And then they told me that the commencement speech for each ceremony would need to be no more than seven minutes in length. And I said, “Who can I flatter into giving a Samford commencement speech, and then inform them that they have an absolute maximum of seven minutes, and that they need to give the speech not once, but twice?” And Mr. Flynn said, “I think we have found our commencement speaker, and it is you.” Which brings us to this moment of reluctant oratory. As a survivor of more than 100 commencement speeches, several given myself, I can summarize very quickly most of what I remember about them: not very much. Graduates don’t attend commencement ceremonies to pay attention to the speaker, parents and families don’t arrive waiting to hear what the speaker might say, and faculty members, well, most faculty members stopped listening to commencement speeches during the Bush administration. The first Bush administration. So, with the lowest of low expectations for the impact of this particular commencement speech, here it is. Actually, I’m about to give you the two most important words I’ve learned in life, so my protestations of the insignificance of these remarks is somewhat disingenuous. Here are the two words. Respect everyone. That’s it. That is the summary of much of what I’ve learned across the arc of 60 years. Respect everyone. Two words that mean the difference between harmony and chaos, and trust and fear, and success and failure, and happiness and despair, and helpfulness and obstructionism. You’ve earned a degree, and we’re recognizing and celebrating that today because it is a big deal and you’ve spent, or someone who loves you has spent, a lot of money and you’ve invested an extraordinary amount of time in attaining the degree. We are justifiably proud, and we believe that you are going to put the degree to good use and that the world will be better for all the things you will do. But if you haven’t learned to respect everyone, our delivery of a Samford education will have been substandard, and we will have failed you. Respect everyone. Respect the person at the Publix who puts your groceries in a bag. Respect the drivers of the other three cars at a four-way stop. Respect the employee in the call center, on the other end of the line, reading from a script, when you’re trying to get information about your account. Respect the person who argues with you about your politics. Respect the food service worker in the drive-thru window who gets the order wrong and puts mayonnaise on your hamburger. Respect the coworker who otherwise grates on your nerves. Respect the person who hates your religious convictions. Respect the person who hates you. If you’ve earned a doctoral degree today, respect the person with a master’s degree. If you’ve earned a master’s degree, respect the baccalaureate. If you’ve earned a bachelor’s degree, respect the high school degree and the GED and the person with no degree at all. Respect the preacher and the protestor. Respect the preschooler and the ancient man who should probably have his car keys taken from him. Respect the professor and the prostitute. Because God made them all, and God loves them all, and it is the very least—the very least—that we can do to respect them all. Respect everyone. The lesson is simple and profound, and it may have more to do with your success and your happiness and your substance than anything that you’ve spent thousands of dollars to receive at Samford. Remember the words always, but especially in the fractured moments when others are not respecting you, when you are under assault, when you are weary, when all you want to do is to lash out and return slight for slight, insult for insult, and hurt for hurt. “Beloved, let us love one another, for love is of God.” During this Christmas season, and in this important moment in your life and in all the less significant moments, remember those two words, “respect everyone,” and practice them and live them and start again when you fail, and then marvel at the difference they will make in your life and in the lives of those you encounter. And it will be challenging, and heart-wrenching, and inspirational, and difficult, and daunting, and hopeful. And at the end of your life, your regrets will be fewer than they might otherwise have been. And that, my friends, is a seven-minute commencement speech, with one minute to spare. Thank you, and Merry Christmas!